Grain fields and other cultivated or dry disturbed areas, including roadsides, railroads, bluffs, and clearings in forests. 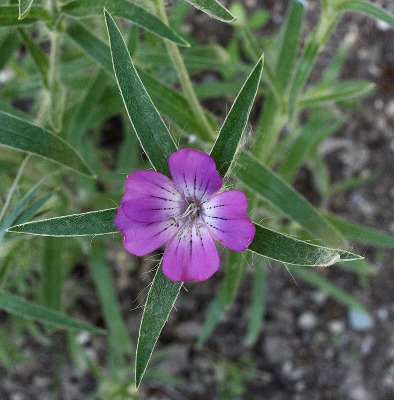 Introduced from Eurasia, where it is also a weed of cultivated lands. Known in Michigan at least since 1837, when it was collected by the First Survey in Lenawee Co., but not commonly collected recently. The prominent calyx lobes exceed the large pink-purple petals, making this a very distinctive as well as showy species. MICHIGAN FLORA ONLINE. A. A. Reznicek, E. G. Voss, & B. S. Walters. February 2011. University of Michigan. Web. April 22, 2019. https://michiganflora.net/species.aspx?id=736.